Four companies in Muting and Ulilin Districts of Merauke Regency have been asked to give work to indigenous Papuans, and especially holders of customary rights over the land the companies are using. The four companies that are operating in the two districts are PT Bio Inti Agrindo, PT Cahaya Bone Lestari, PT Agrinusa Cipta Persada and PT Berkat Cipta Abadi. All four companies are involved in the oil palm sector. written agreement between the companies and the customary land rights holders to recruit local Papuan labour, said Imanuel Basik-Basik. Papuan labour once the company started operations, but until now there has been no follow-up on this”, said Imanuel Basik-Basik. and PT Berkat Cipta Abadi 14,525 hectares. self-managed. “PT Cahaya Bone Lestari is a self-management corporation where the profits from the production are shared with 30% going to the customary rights holders and 70% to the company. This is because about 363 hectares of the land worked by the corporation belongs to local residents, while 60 hectares belongs to the local government,” revealed Efendy Kanaan. A snippet of footage and chatters around the Freeport strike in West Papua. The Freeport workers’ union says it is a matter of simple “revenue transparency”, the international trade union says the dispute “has nothing to do with” West Papua politics, and a worker recorded in his video testimony that the walk-out was something “important” and worth keeping. The Geneva-based International Federation of Chemical, Energy, Mine and General Workers’ Unions (ICEM), its Australian affiliated group Australia’s Construction, Forestry, Mining and Energy Union (CFMEU) and the Freeport Indonesia Workers’ Union, SP KEP SPSI, met in Jakarta from October 30 to November 2, 2011. In this video, SP KEP SPSI was represented by Airan Koibur, ICEM was represented by Information and Campaign OfficerDick Blin, and Wayne McAndrew spoke for the CFMEU. 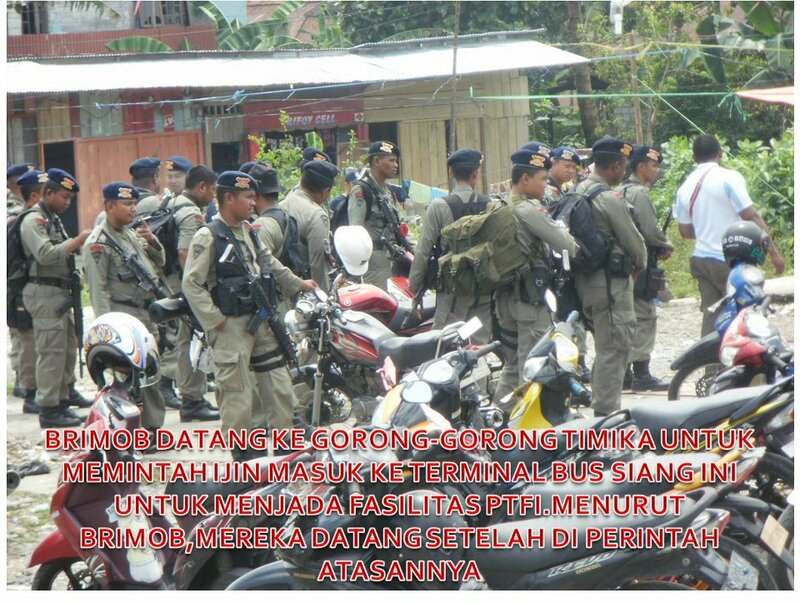 JUBI, 13 October 2011In connection with the shooting dead of Petrus Ayamiseba who worked at the catering department for workers at Freeport, the Dewan Adat Papua has declared that it is essential to withdraw army and police troops from area around the Freeport mine. Speaking on behalf of DAP, Dewan Adat Papua, Forkorus Yaboisembut said that the chief of the Indonesian police, the chief of police in Papua and the commnder of the XVII Cenderawasih Command should withdraw all their troopa who are currently deployed in the vicinity of the mine. He said that it was important for the police and the security forces to stop exerting pressure on the company. They should also be ordered to stop exerting pressure on the workers. ‘The security forces should stop interfering in any way with the company,’ he said. ‘The two sides involved in a dispute must find a solution together. If they are subjected to pressure, the dispute will never be solved,’ he said. He also said that the Indonesian govrnment should urge the company to provide a clarification about its revenues. ‘If the government can convince the company to review the wages that they pay to the workers, the dispute can be speedily resolved,’ he said. Meanwhile, the lawyer, Yan Christian Warinussy said that the shooting of Petrus Ayamiseba was a gross violation of human rights, and he hoped that the Papua branch of the National Human Rights Commission would speedily hold a meeting with the chief of police in Papua, Police Inspector-General Bigman Lukkaman Tobing to press for this shooting incident to be resolved in the human rights court. He said that if this does not happen, the police will claim that this was nothing more than a criminal act. He want on to say that the shooting to death was a breach of Law 39/1998 regarding safeguarding actions undertaken by the people. Warinussy said that he was currently in Timika and was carrying out his own investigations and he said that he would be having a meeting with the chief of police in Mimika and with the company. The results would be conveyed to the chairman of the Papuan branch of the National Human Rights Commission. Matius Murib. Petrus Ayamiseba who was 36 years old died when he was struck by a burning rod of tin belonging to the police while he was taking part in a demonstration at the Gorong-Gorong Terminal. 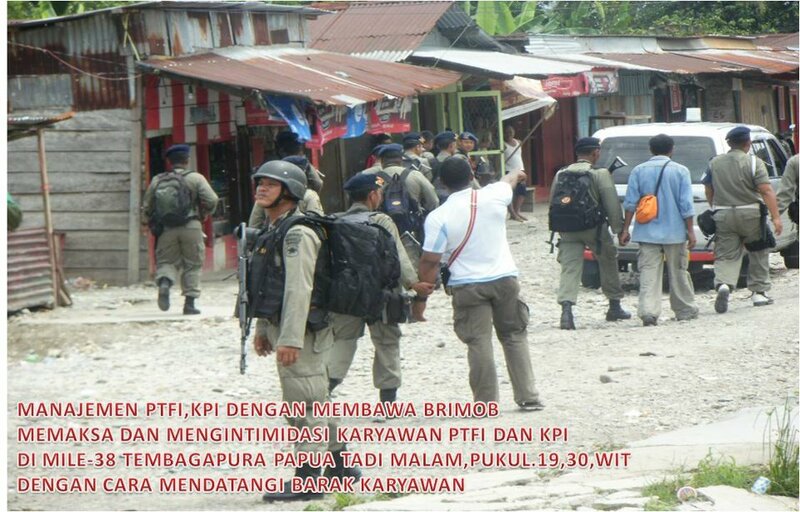 During the incident, another person was also killed, namely Jamil, a member of Brimob.